For just €17 or so (this includes two human beings, two small hairy four-legged children, a six metre van and electricity) per night, this lakeside campsite provides a cheap base for investigating the beautiful Parque Nacional da Peneda-Geres. Although there is no supermarket, you can buy fresh bread from the bar and so long as you have your own transport, you are just ten kilometres from the centre of Ponte da Barca so it’s an easy drive to get provisions. The site is spacious and benefits from thousands of skinny, lanky trees that lead down to the lake. You can park or camp wherever you like, although obviously if you are in a large van you will be limited to certain areas. If you are travelling with four-legged companions then you can either walk around the perimeter of the site or leave the site and turn left immediately and then follow the road until you reach a little path on your left that goes around the perimeter of the campsite and all the way back round to the campsite entrance. The facilities are fairly good with hot showers (although they sometimes take some regulating) and a washing machine which costs €4 for a decent sized load. There is a bar and snackbar on site which serves typical Portuguese fodder and large plates of French fries and chicken etc. Nothing particularly healthy or glamorous but the prices are good and the portions on the large side. They also sell drinks and ice creams. This is a lovely campsite with a good relaxed vibe to it. Plenty of room to find yourself a bit of solitude alongside a pretty lake. 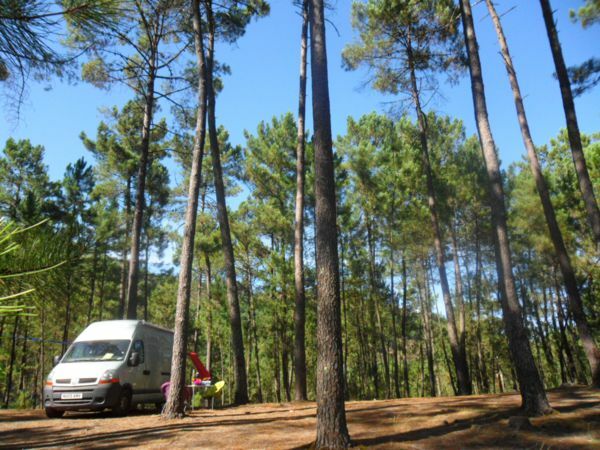 This entry was posted in The Minho Camping and tagged best campsites in Portugal, camping in Portugal, cheap accommodtion in the Minho, Parque de Campismo Entre Ambos-os-Rios, where to stay in The Minho by david. Bookmark the permalink.